Using content marketing as part of a larger Internet marketing program can be key in attracting, engaging, and converting new customers. However, many practitioners can get caught up in the day-to-day stresses and tasks which may blind them to the changes that are occuring on the web at a very rapid pace. First off, what is Graph Search? Facebook has amped up its search capabilities by rolling out this new feature. Danny Sullivan’s article provides a step by step deep dive into using Facebook’s new Graph Search. One of the biggest challenges for marketers using social media is finding enough interesting and unique content to share with their followers. This post provides 20 different content ideas to better attract and engage your online audience. In a recent interview, Google’s CEO Larry Page expressed some harsh criticism of Facebook, saying the company was admittedly strong in the social space, but was lacking in the way they handle their products. Did you know that Slideshare is the largest content-sharing community for professionals? Slideshare’s traffic is largely driven by search and social networks and should be used as an essential tool in your content marketing toolbox. Many marketers seem to forget the basic principles of social networking. Social media should be used as a means to interact and engage with prospects and customers, not just viewed as a sales acquisition tool. Social media is a powerful customer service tool, enabling companies to respond to questions, concerns and compliments in real-time. Learn how Sprint, NetFlix and SiriusXM Radio have created a culture of customer care through social. Is your audience hanging on your every word, anticipating the release of your next piece of content? See how two companies use sequenced content to generate higher quality leads and social activity and take away tips to help your brand better leverage this content marketing strategy. TopRank’s Alexis Hall shares an explanation of the four types of online personalization, after experiencing a stellar personalized online shopping experience. Discover the steps to successful personalization for your own customers, as shared by Greg Ott. Social media has surfaced as one of the most powerful PR tools in a company’s arsenal. Country Crock, Alfa Telecommunications and iConstituent have important lessons to share, based on their Facebook PR experience. Ekaterina Walter, author of Think Like Zuck: The Five Business Secrets of Facebook’s Improbably Brilliant CEO, shares her insight in this guest post on the TopRank blog. Check out her practical advice on publishing Facebook content that earns better engagement from fans. Bridgeline Digital underscores the importance of corporate blogging by relating a TopRank® Blog post by Lee Odden. Imagine what blogging can do for you? A lot, they say. TopRank® CEO Lee Odden is named Brilliant Blogger of the Week by Blogworld, organizers of the NMX Live conference in Las Vegas. Odden shared his integrated marketing expertise in War of Words: Myth-Busting Social, SEO & Content on January 8th at NMX. 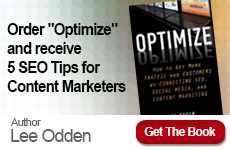 Emily Reeves and Evan Daugherty recently reviewed Optimize by TopRank® CEO Lee Odden and share their thoughts in this engaging podcast. 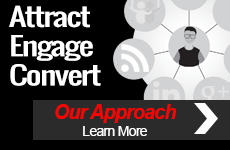 TopRank® CEO Lee Odden dispels content marketing myths and helps companies prepare for 2013 in this guest post on the Content Connection blog. Nine out of ten B2B marketers plan to add content tactics to their marketing this year… are you one of them? Miranda Miller, TopRank® Content Marketing Manager, spoke with Marketwire recently for their holiday content feature post. Miller shared strategies for keeping content fresh throughout the holiday retail season and preparing for 2013. You made me laugh with that quip… you got my number on that one, my friends! Seriously, Lee – thank you so much for taking the time to do the interview and for writing one of the hands-down best books I’ve read in a long time. I include it in all my presentations as one of the three “must read” books for PR & marketing pros.